Cassini prepares for final orbital “Grand Finale” at Saturn. Erik Wernquist, the same filmmaker who created 2014’s “Wanderers” and a stunning New Horizons promotional film in 2015, has created a new video highlighting NASA’s Cassini mission’s final days at Saturn. The Cassini spacecraft will begin its final series of orbits to cap a 13-year groundbreaking science mission known as the Grand Finale. For the first time ever in Cassini’s time at Saturn, the spacecraft will fly in between the planet’s rings and atmosphere. No spacecraft has ever before flown in this region of any of the solar system’s ringed planets. After 23 orbits, Cassini will dive into Saturn’s upper atmosphere September 15 where it will be destroyed. In 2008, mission managers explored a range of End of Mission scenarios that would protect Saturn’s moon’s from Earthly contaminants before ultimately deciding on atmospheric reentry. 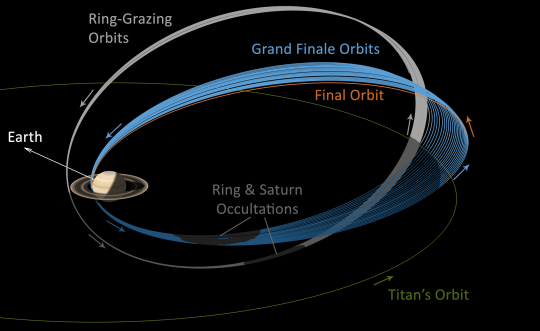 Cassini began her End of Mission manoeuvres on November 26, 2016, when it began the first of 20 ring-grazing orbits. A close flyby of Titan April 22 will alter the spacecraft’s trajectory to begin the first of 23 orbits in the Grand Finale, which will begin April 26. Cassini launched from Earth on October 15, 1997, and entered Saturn orbit June 30, 2004. Six months later, on January 14, 2005, the European-built Huygens probe attached to the spacecraft landed on Titan, becoming the first probe to land in the outer solar system. Originally scheduled for a four-year mission ending in 2008, Cassini received two mission extensions in 2008 and 2010, with the latter ending in 2017. With the spacecraft’s fuel reserves low, the Cassini team decided to end the mission.